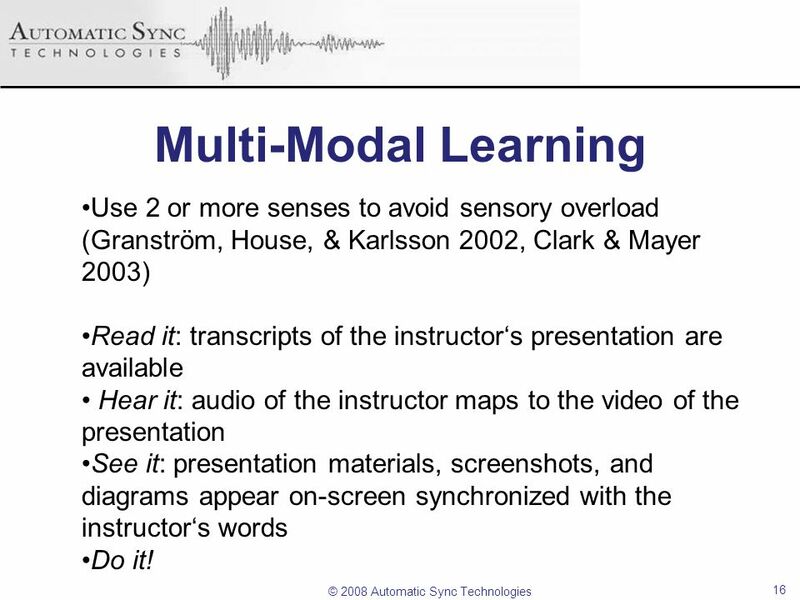 16 Multi-Modal Learning Use 2 or more senses to avoid sensory overload (Granström, House, & Karlsson 2002, Clark & Mayer 2003) Read it: transcripts of the instructor‘s presentation are available Hear it: audio of the instructor maps to the video of the presentation See it: presentation materials, screenshots, and diagrams appear on-screen synchronized with the instructor‘s words Do it! 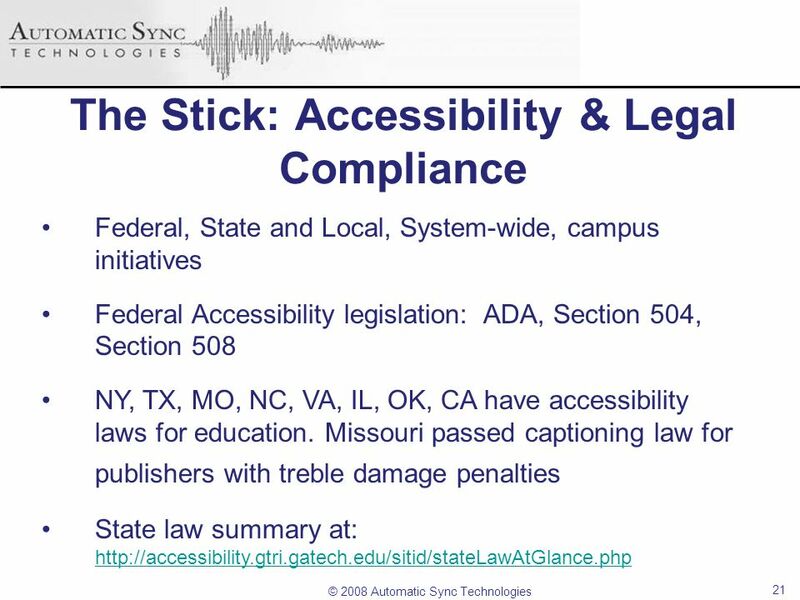 22 Section 508 requires Federal electronic and information technology to be accessible to people with disabilities, including employees and members of the public. 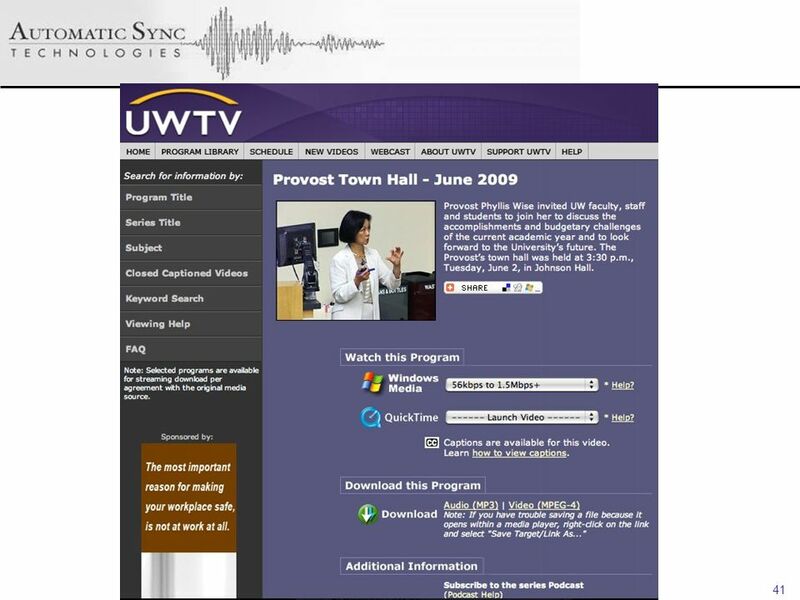 § Web-based intranet and internet information and applications. 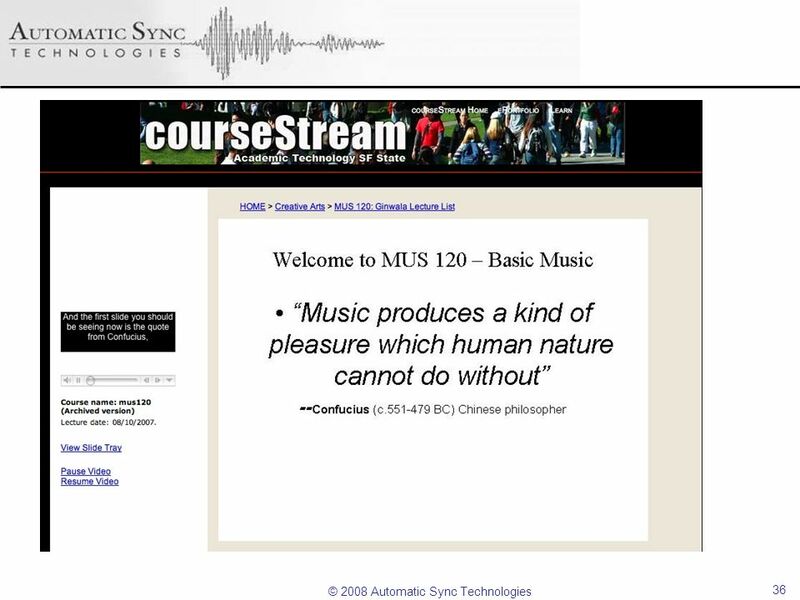 This section applies to all websites and is not unique to training materials or online courses. 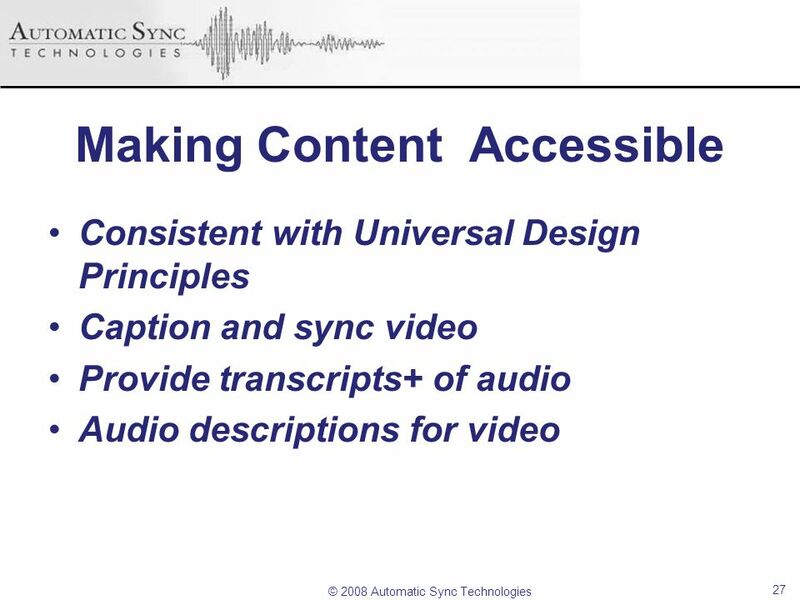 The standard requires that web content be constructed and tagged in a manner that enables the effective use of screen readers and other technologies that allow people with disabilities to access internet content. 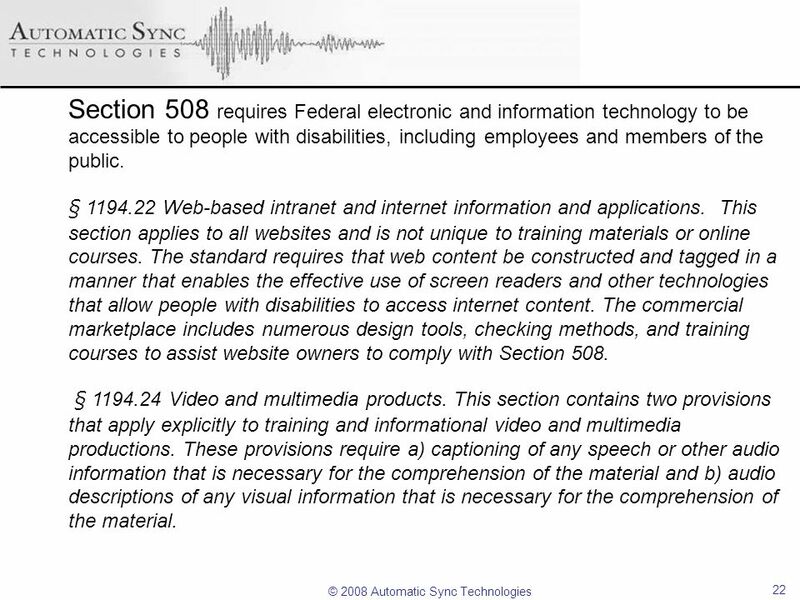 The commercial marketplace includes numerous design tools, checking methods, and training courses to assist website owners to comply with Section 508. 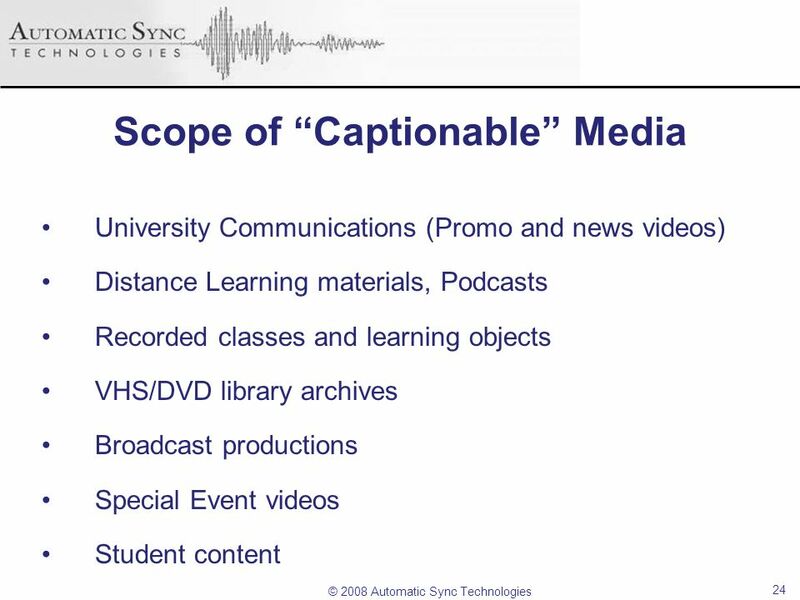 § Video and multimedia products. 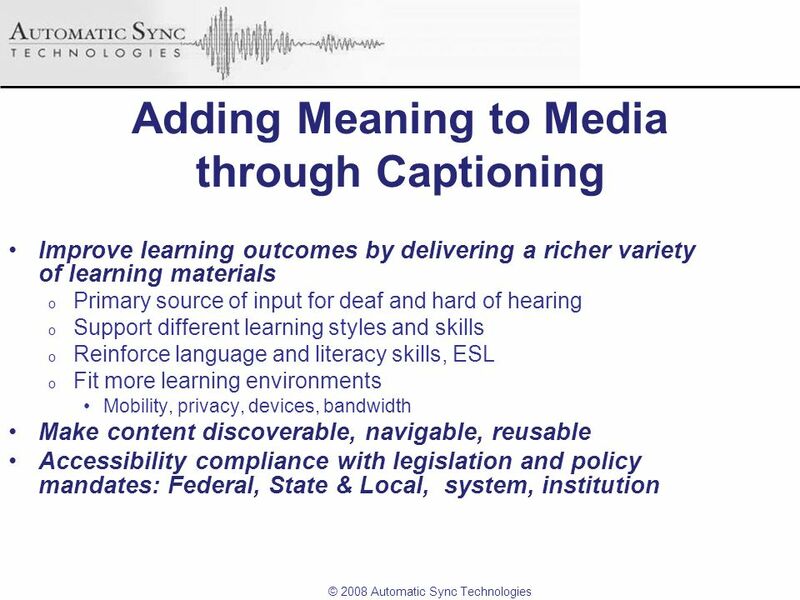 This section contains two provisions that apply explicitly to training and informational video and multimedia productions. 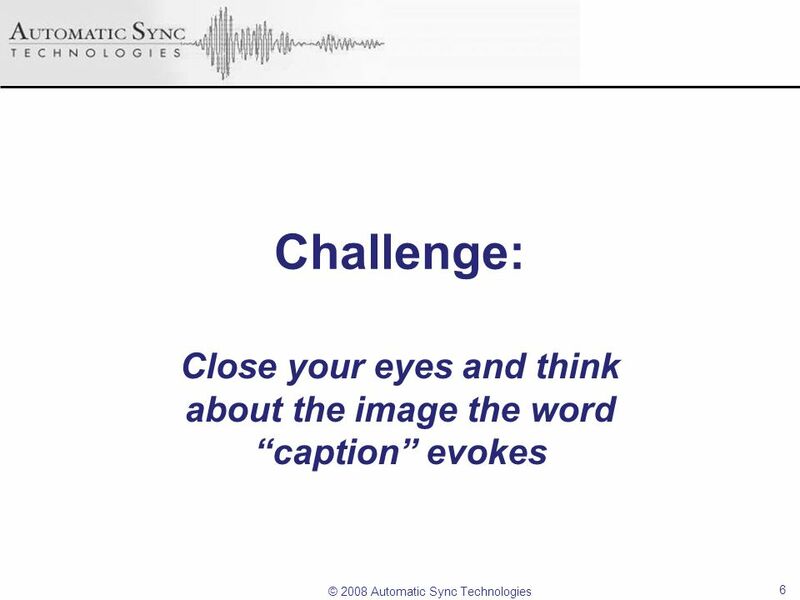 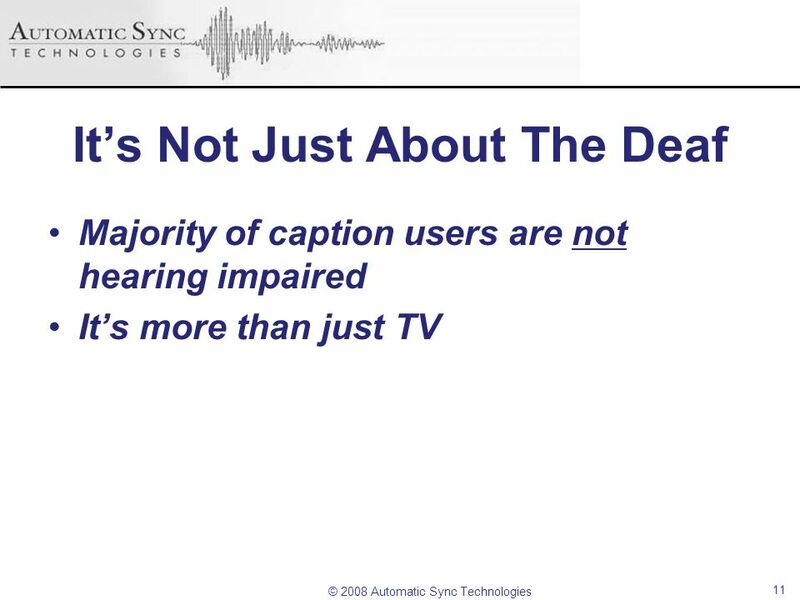 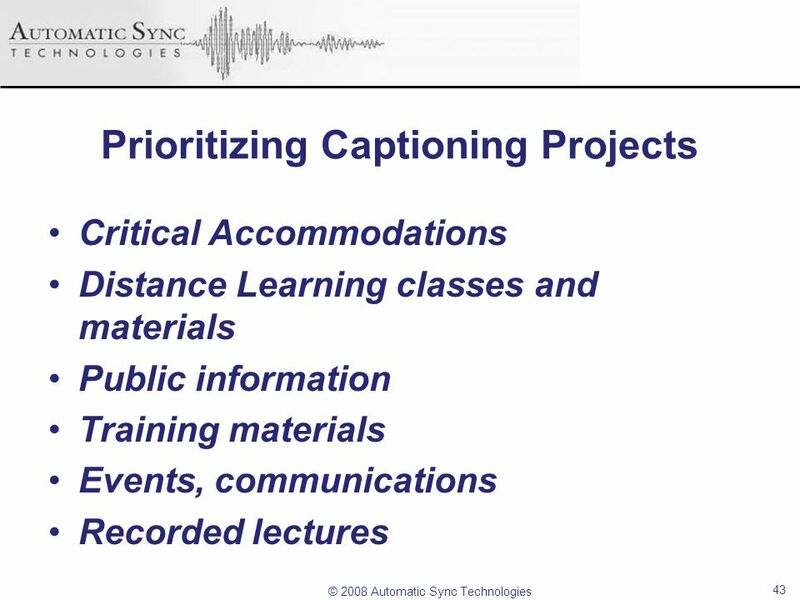 These provisions require a) captioning of any speech or other audio information that is necessary for the comprehension of the material and b) audio descriptions of any visual information that is necessary for the comprehension of the material. 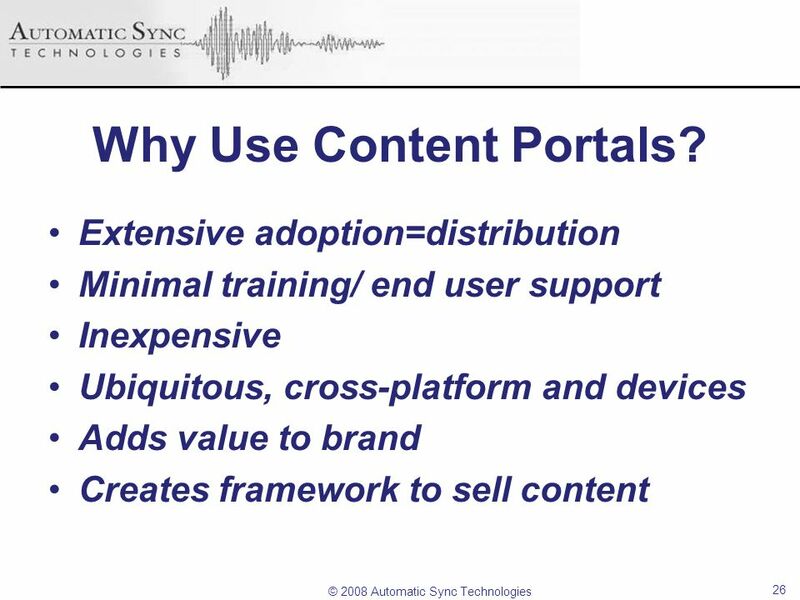 26 Why Use Content Portals? 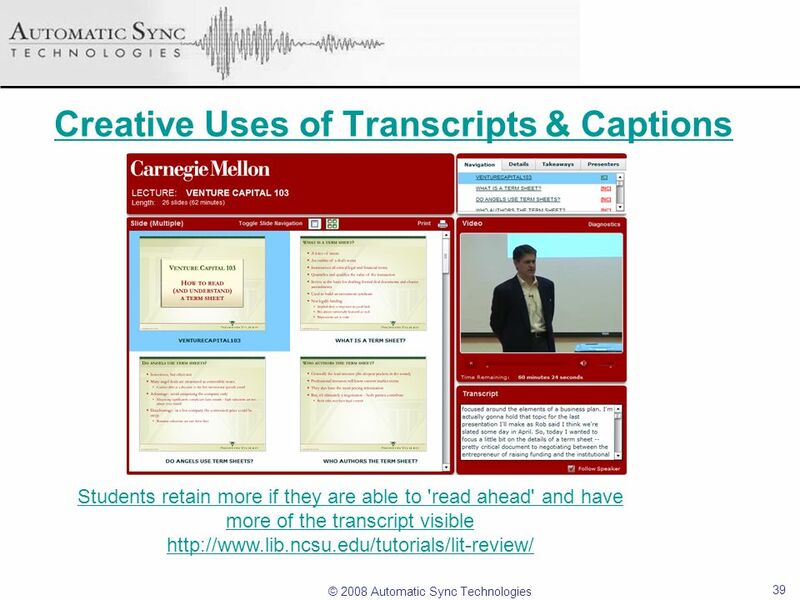 The ability to perform deep searches The ability to print, download, and annotate course materials to improve retention. 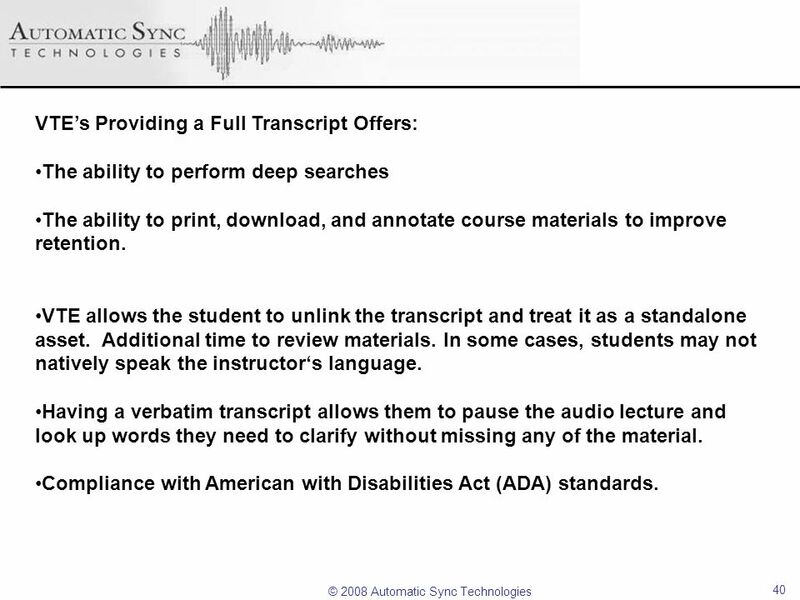 VTE allows the student to unlink the transcript and treat it as a standalone asset. 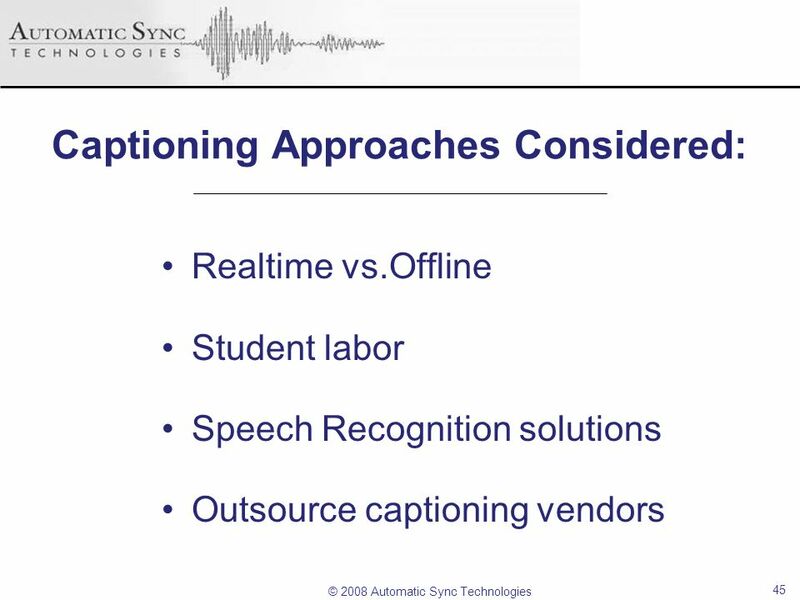 Additional time to review materials. 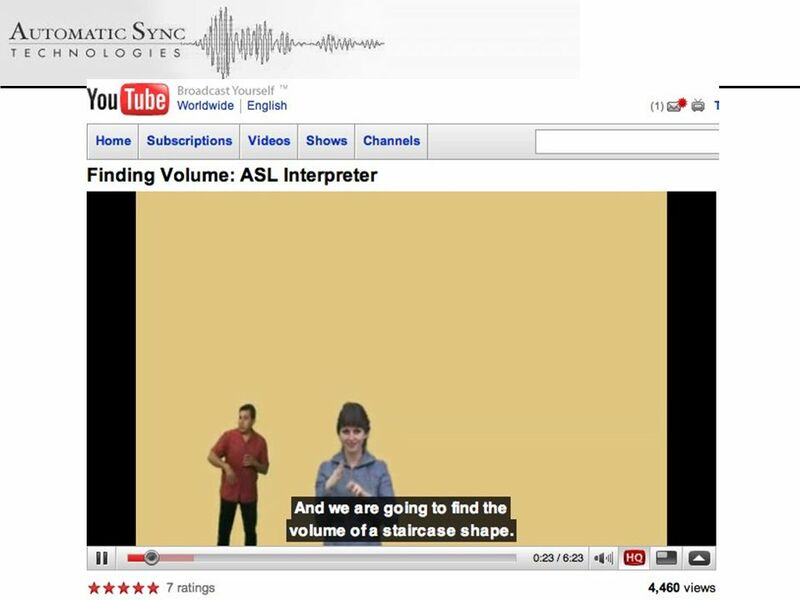 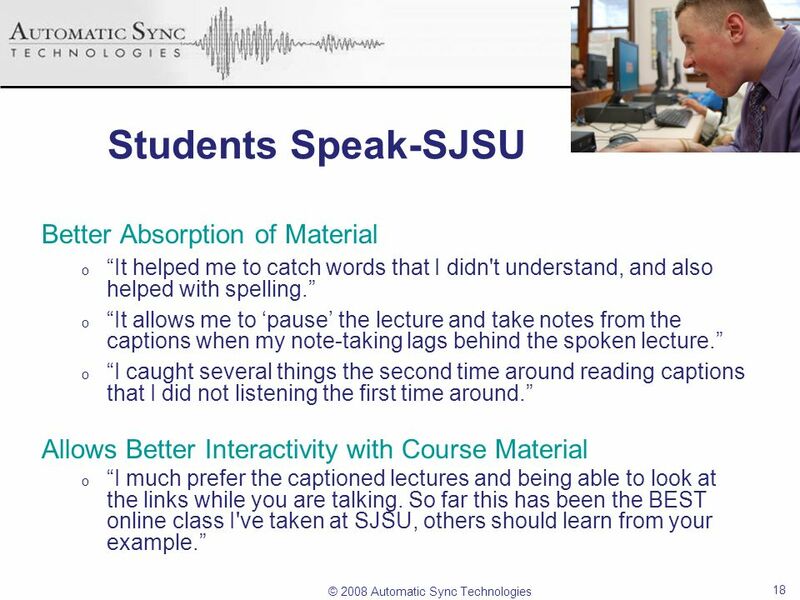 In some cases, students may not natively speak the instructor‘s language. 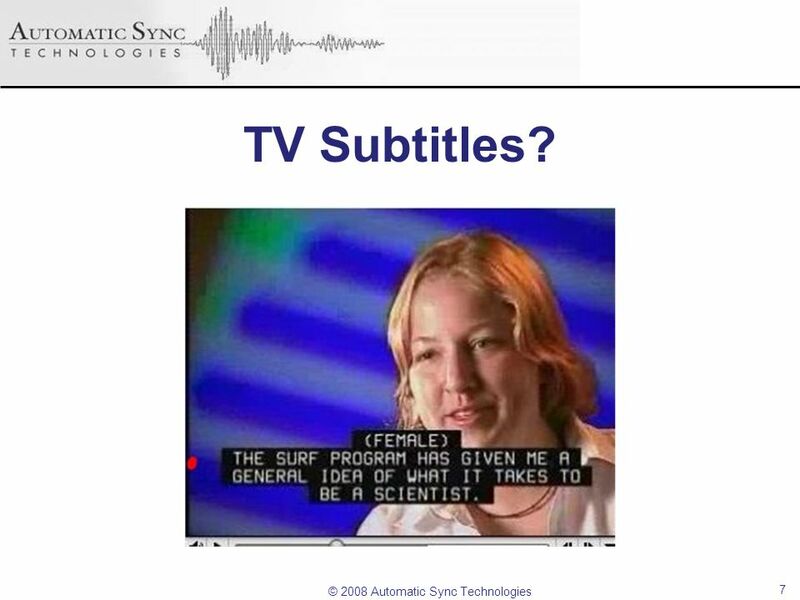 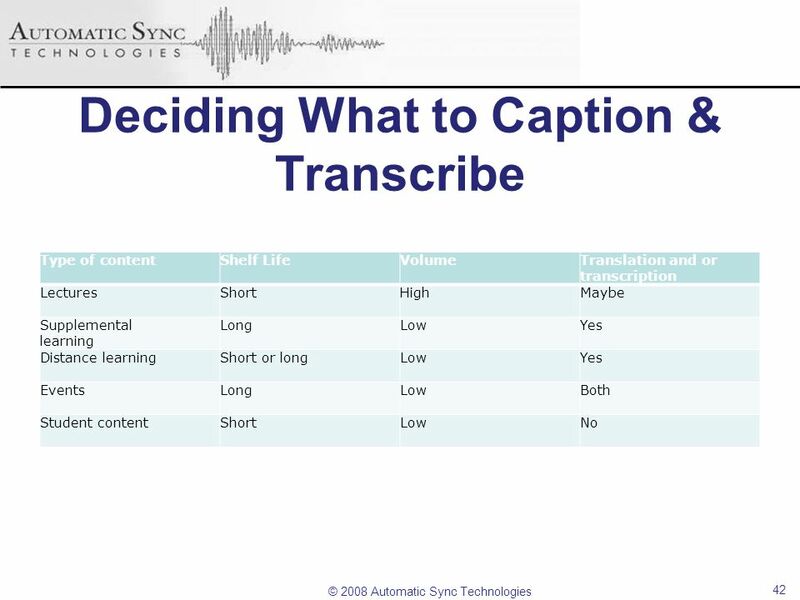 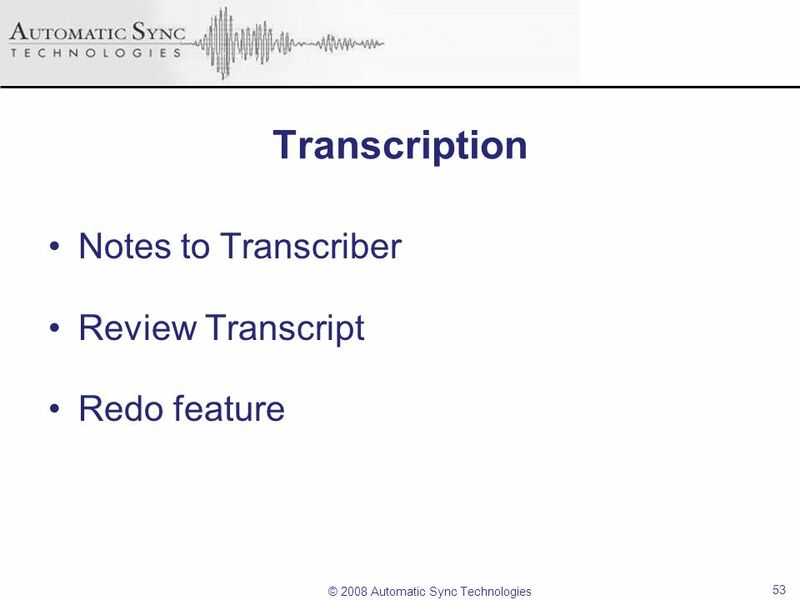 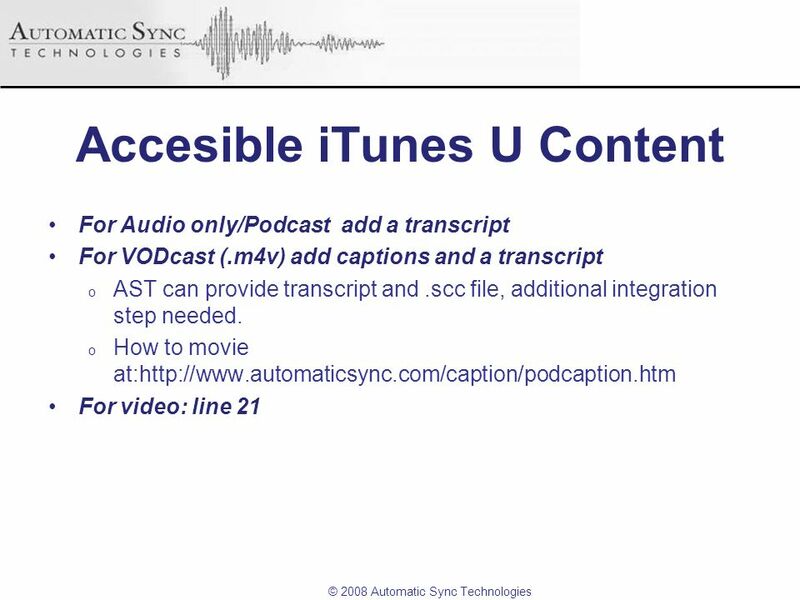 Having a verbatim transcript allows them to pause the audio lecture and look up words they need to clarify without missing any of the material. 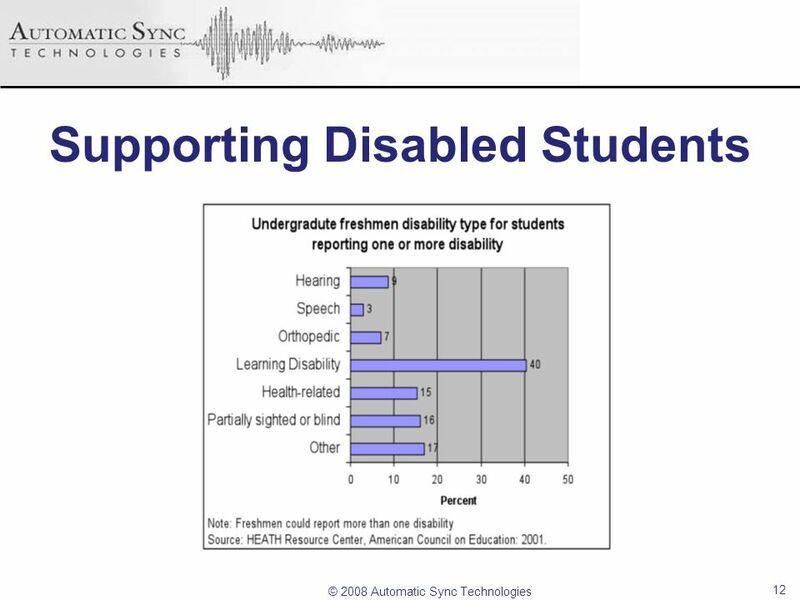 Compliance with American with Disabilities Act (ADA) standards. 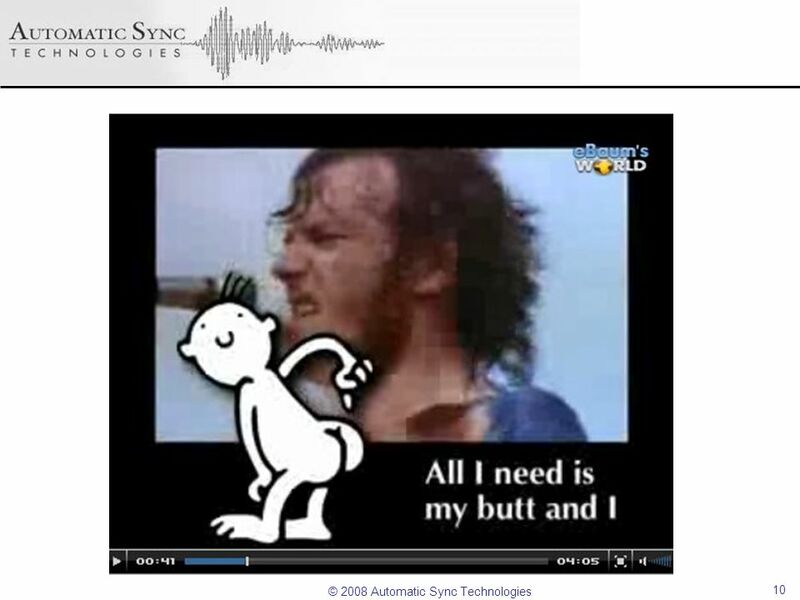 Does it meet the need? 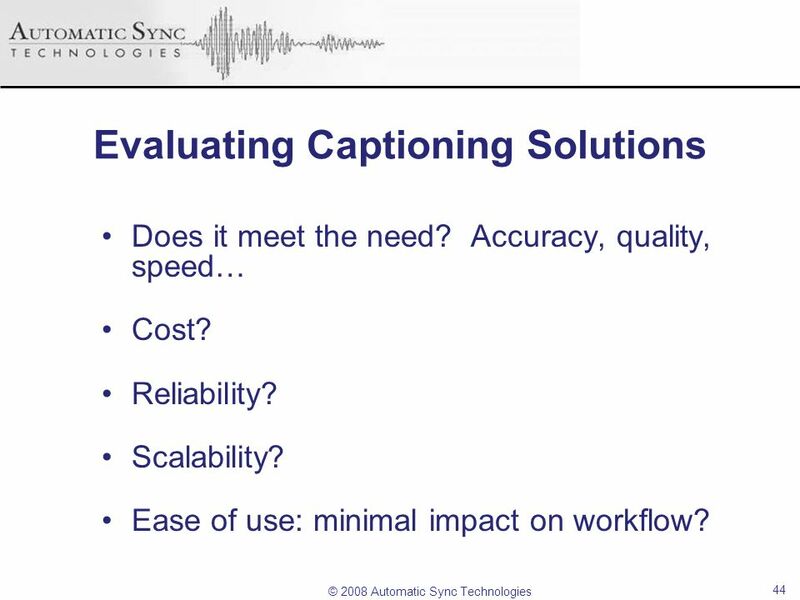 Accuracy, quality, speed… Cost? 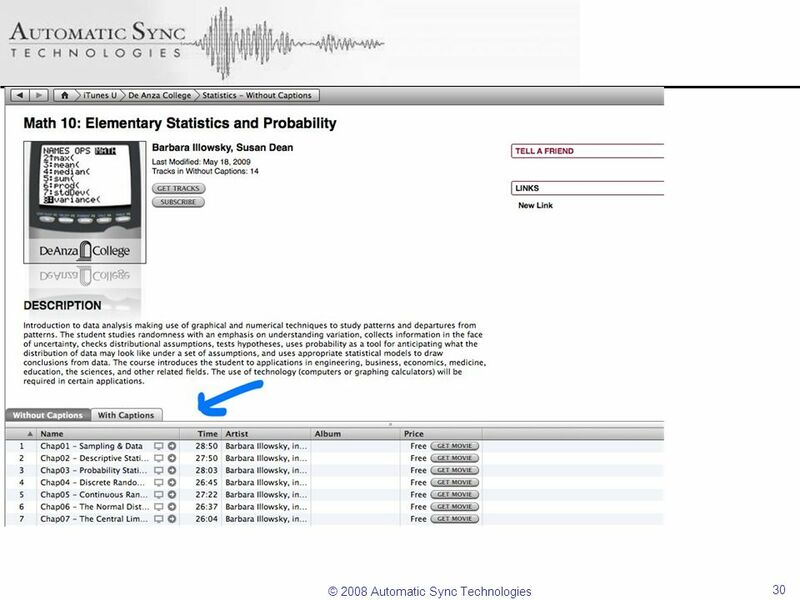 Reliability? 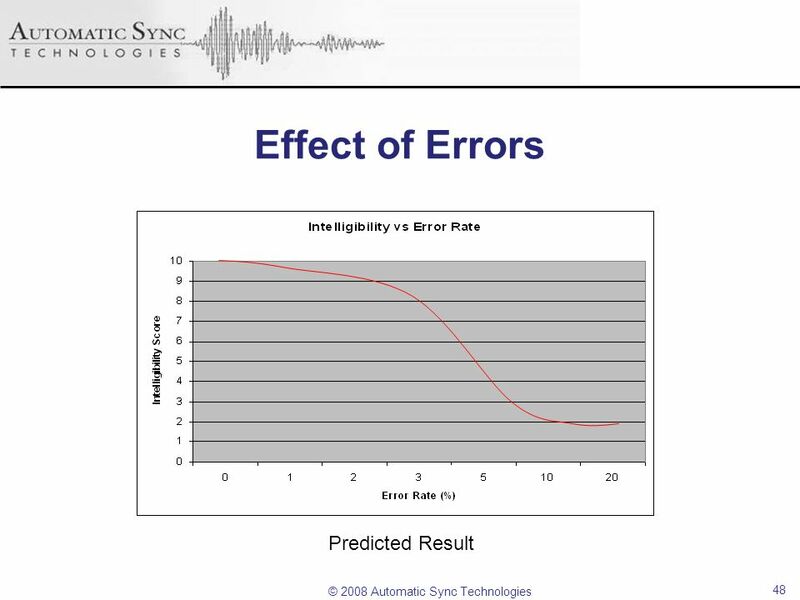 Scalability? 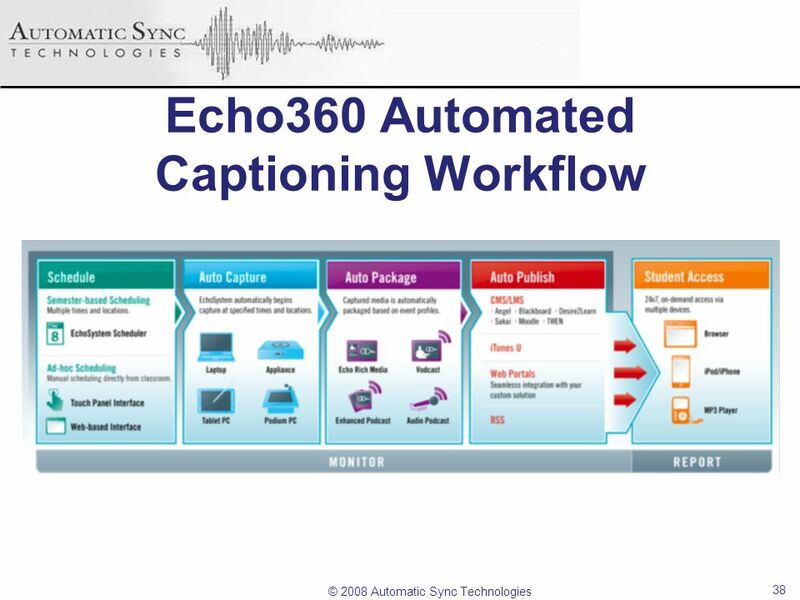 Ease of use: minimal impact on workflow? 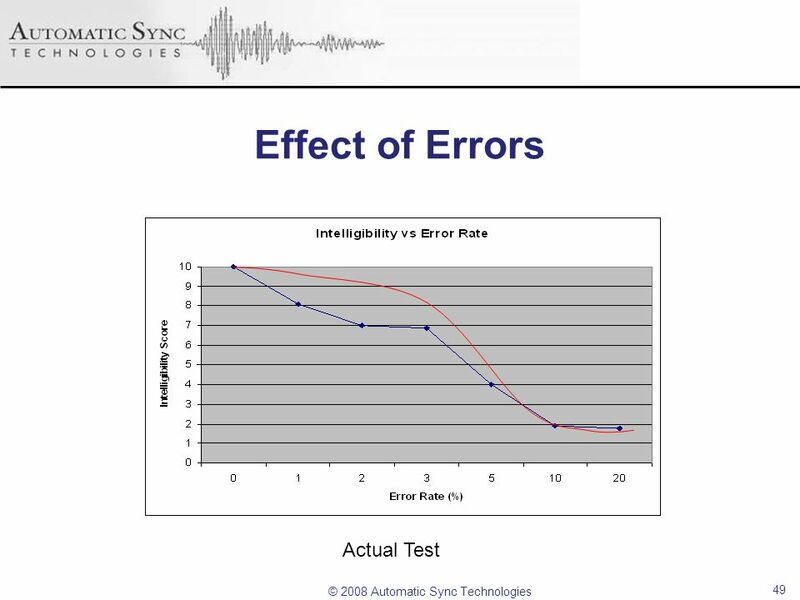 46 Initial Findings Stakeholders did not all fully appreciate the scope of the problem, what is required to create a compliant result, or the cost involved. 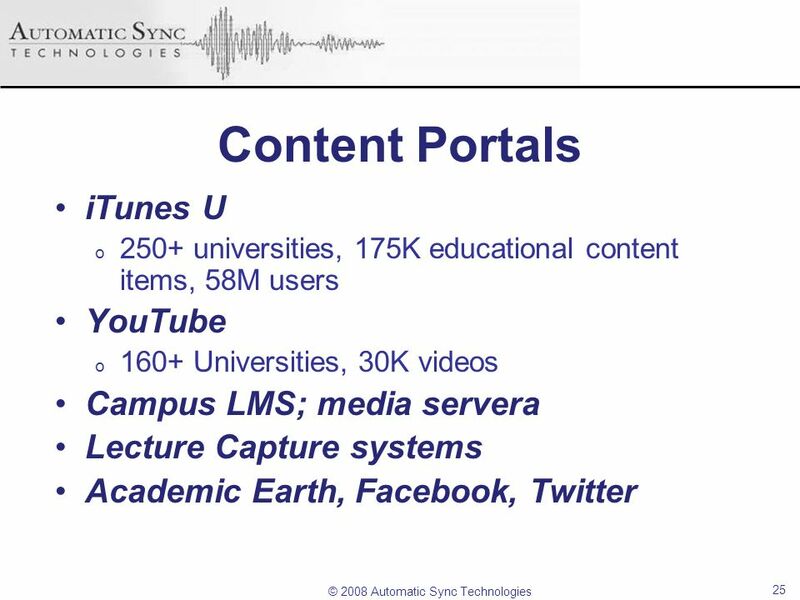 Individual campuses did not have adequate resources to leverage bulk discounts. 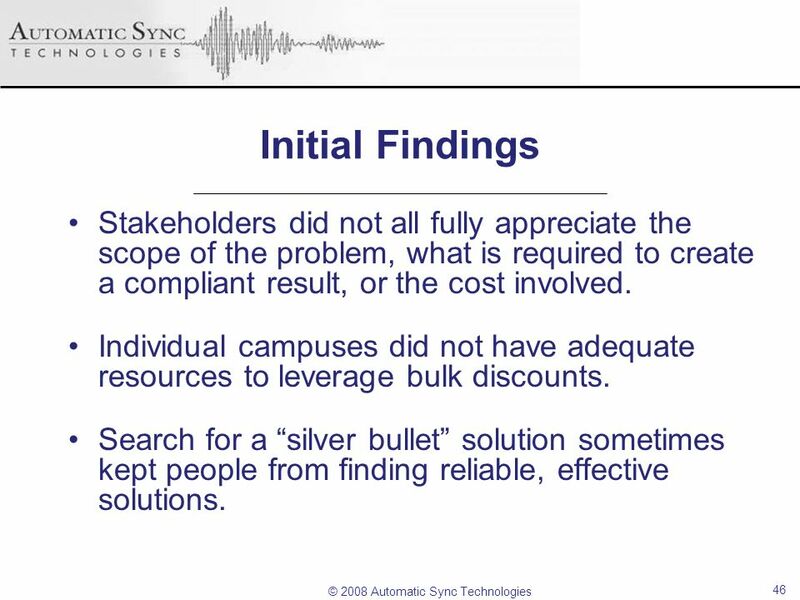 Search for a “silver bullet” solution sometimes kept people from finding reliable, effective solutions. 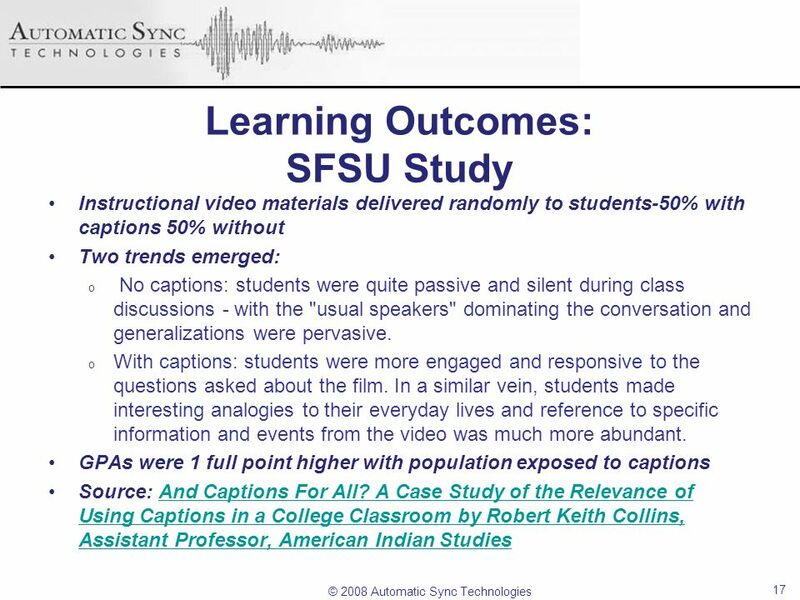 47 Initial Findings Large-scale student-based transcription was difficult to build and scale reliably; more expensive than it first seems. 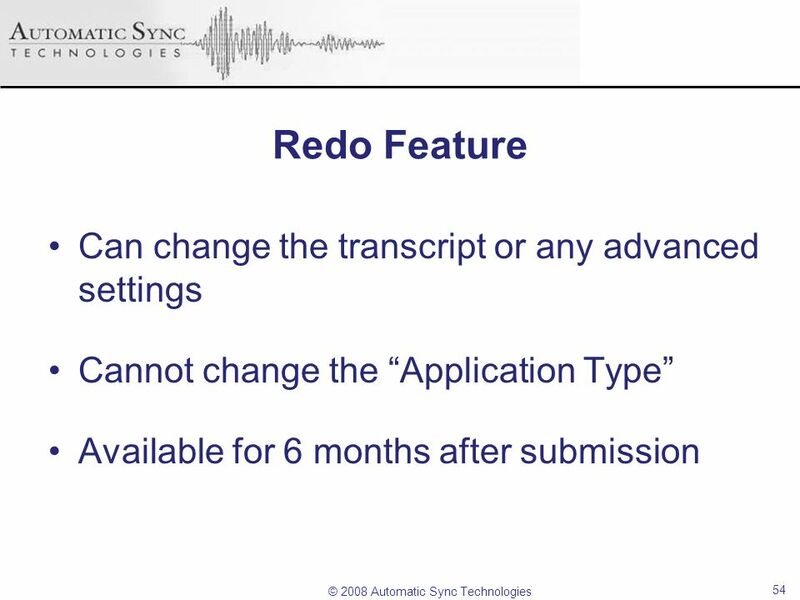 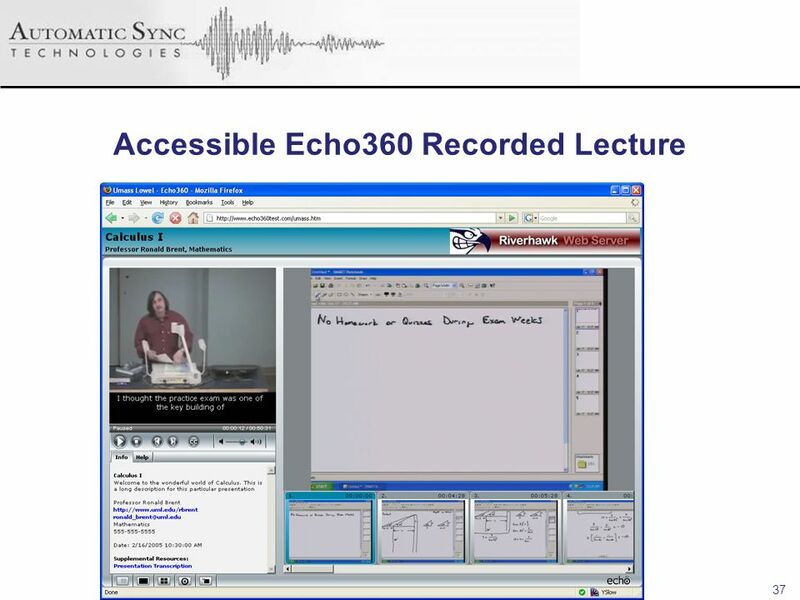 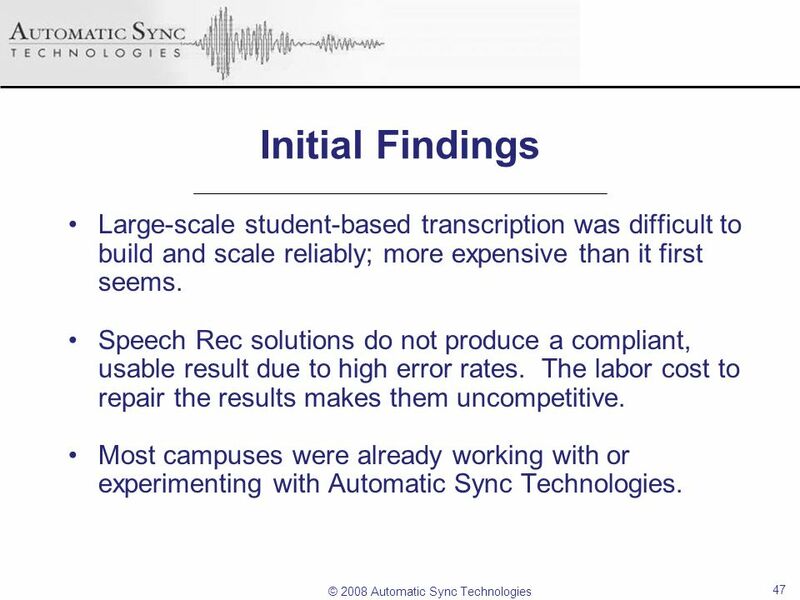 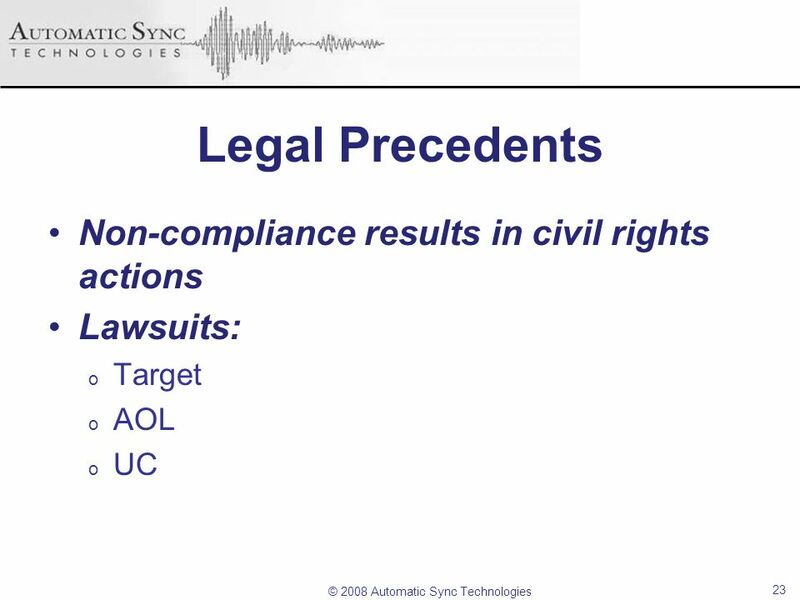 Speech Rec solutions do not produce a compliant, usable result due to high error rates. 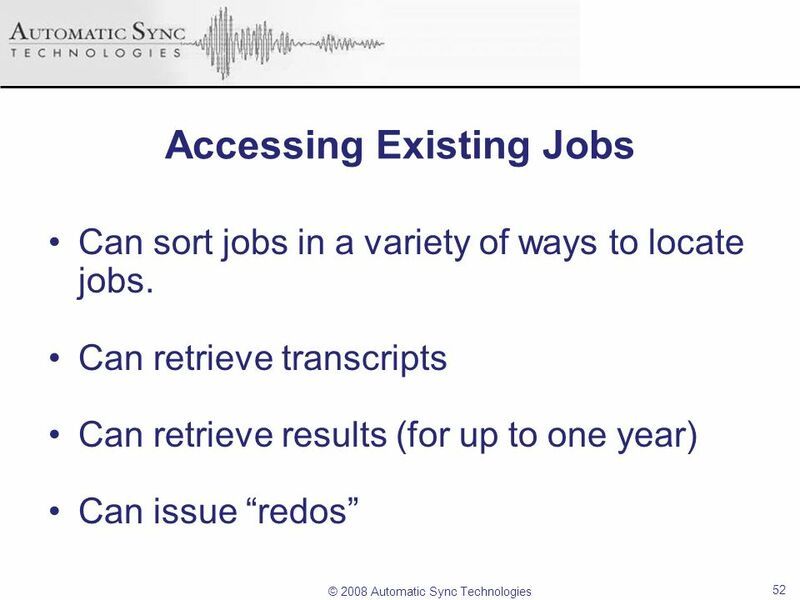 The labor cost to repair the results makes them uncompetitive. 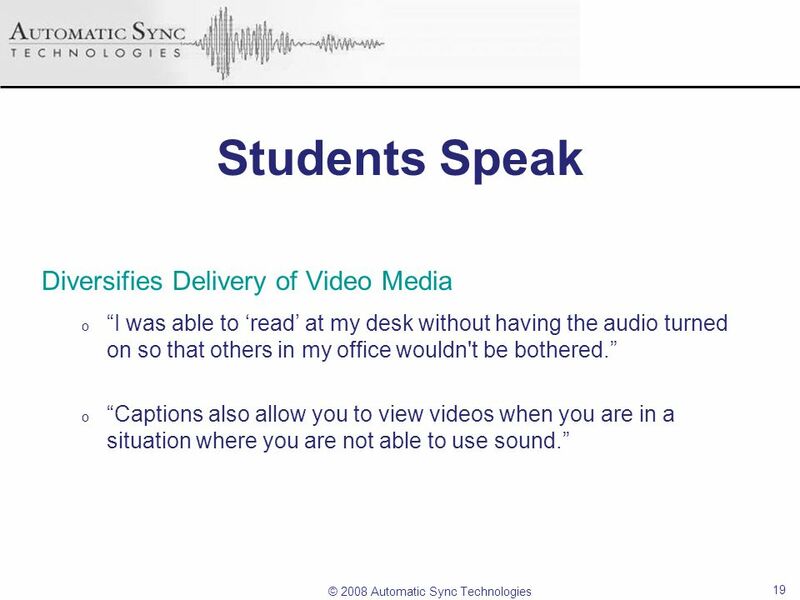 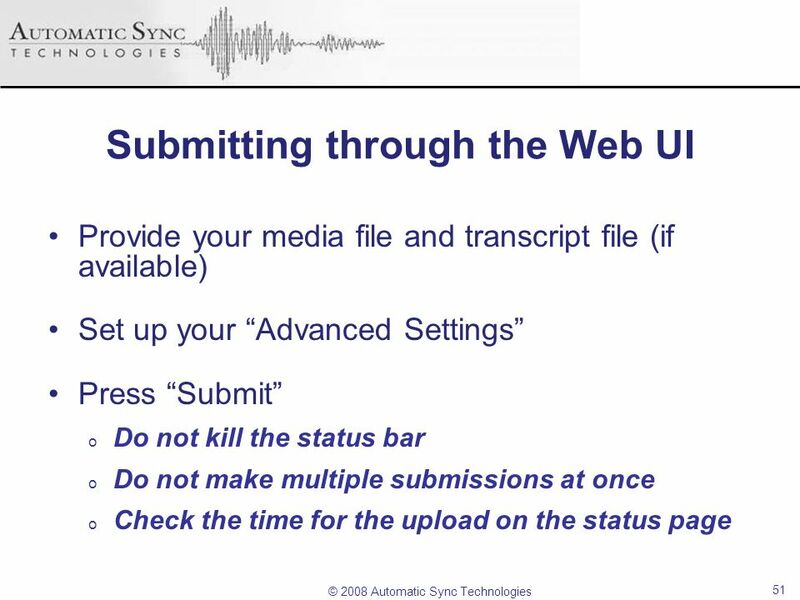 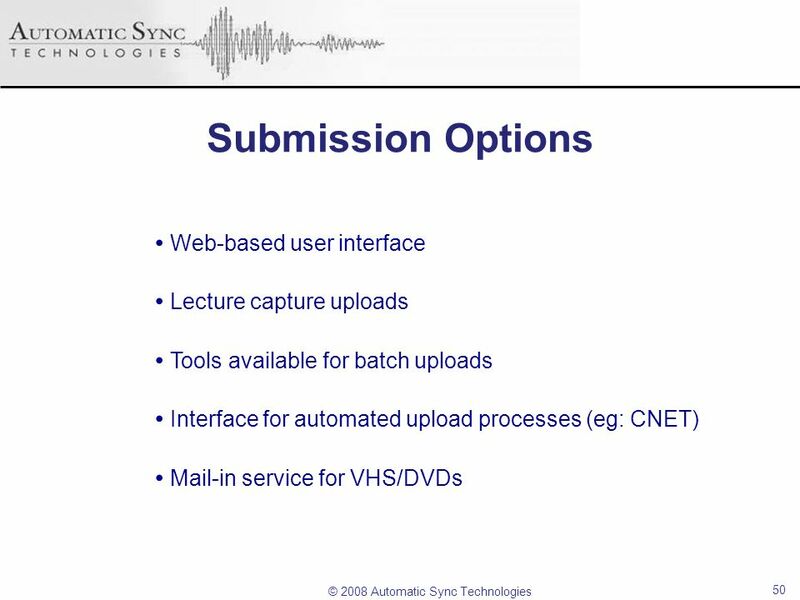 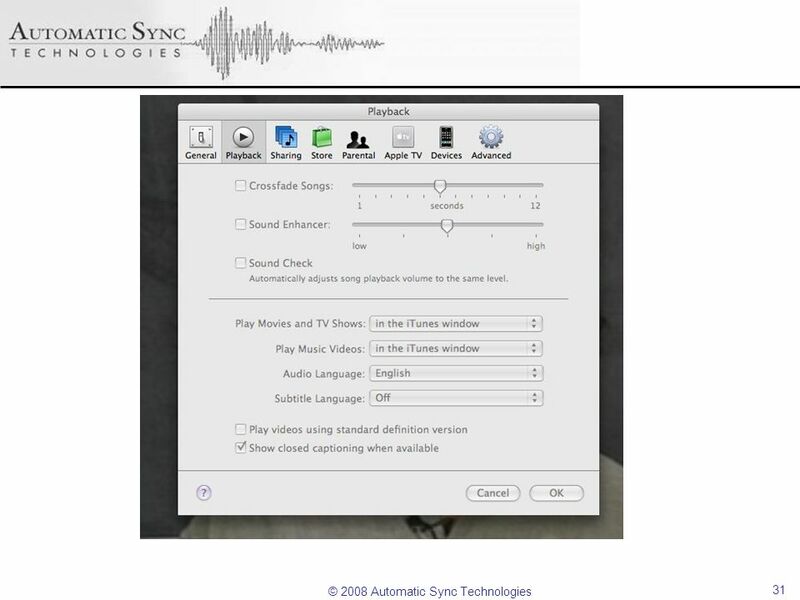 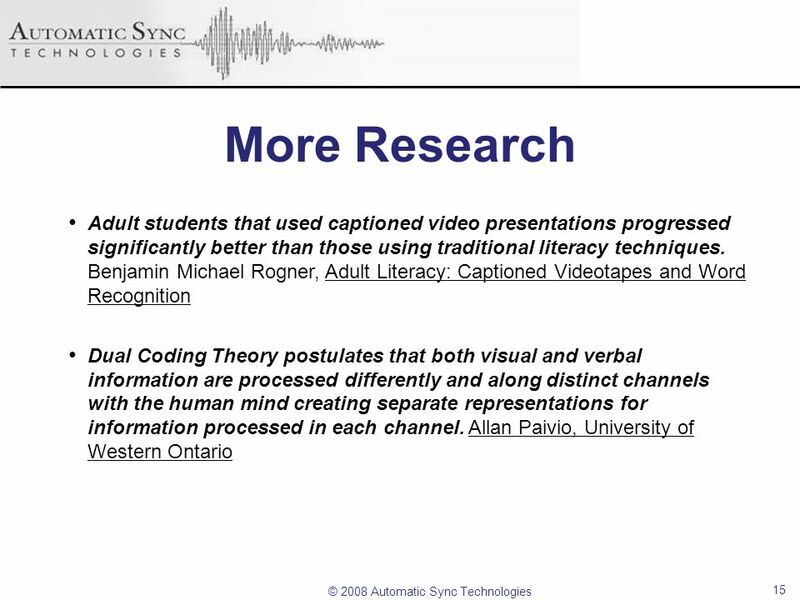 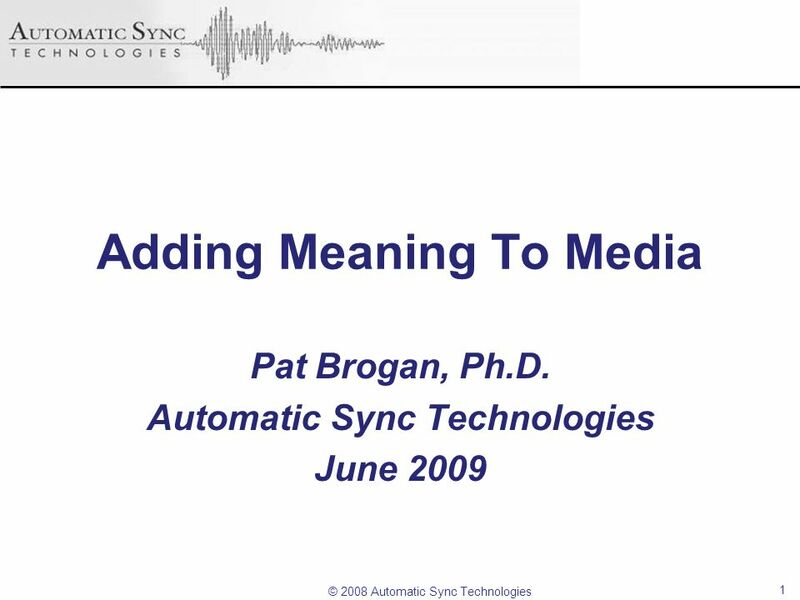 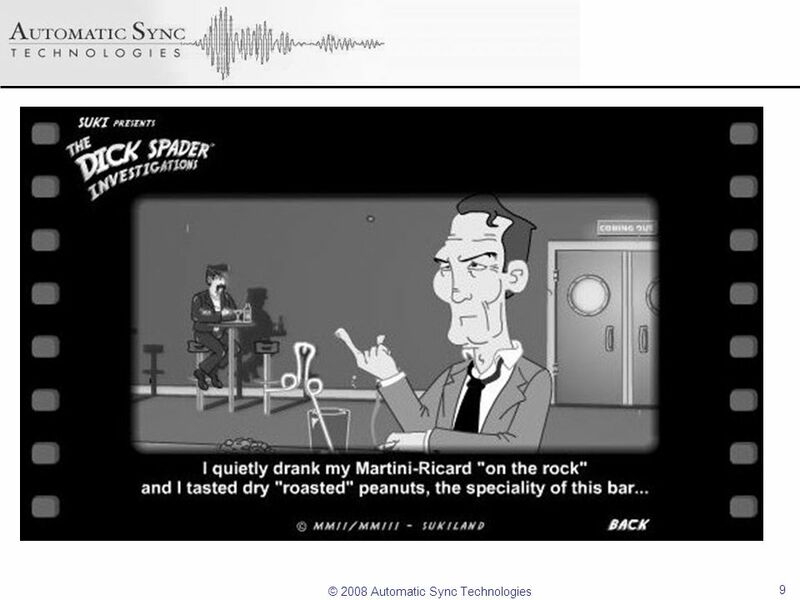 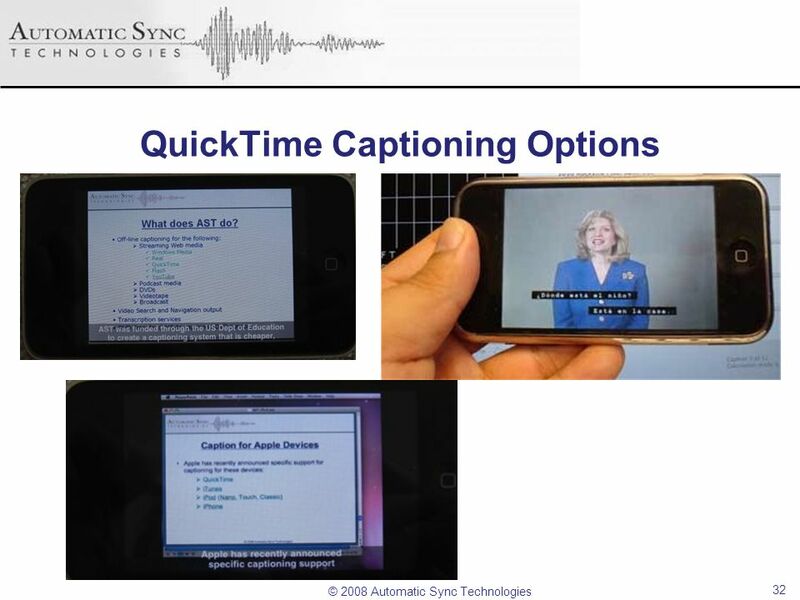 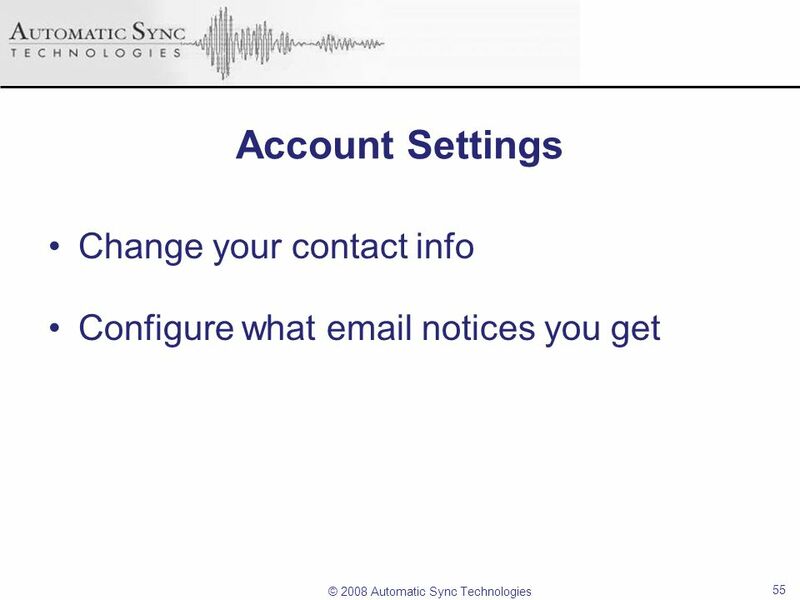 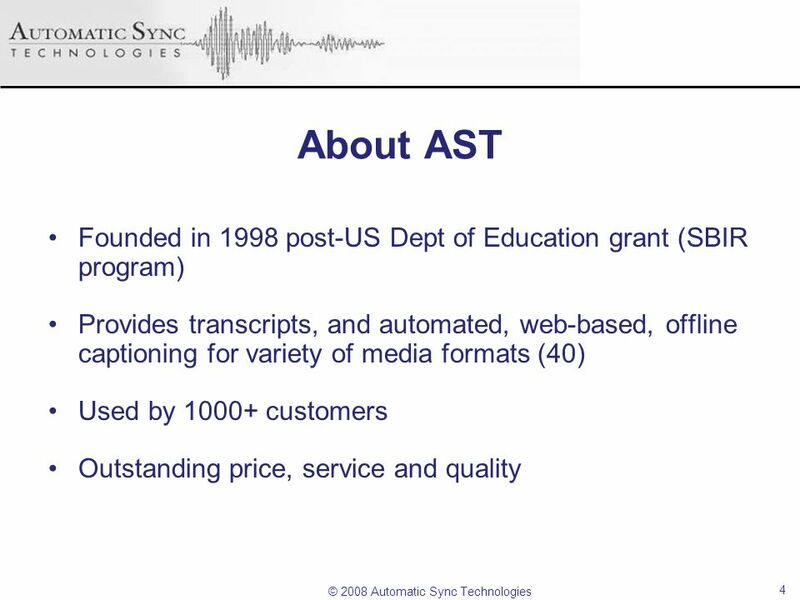 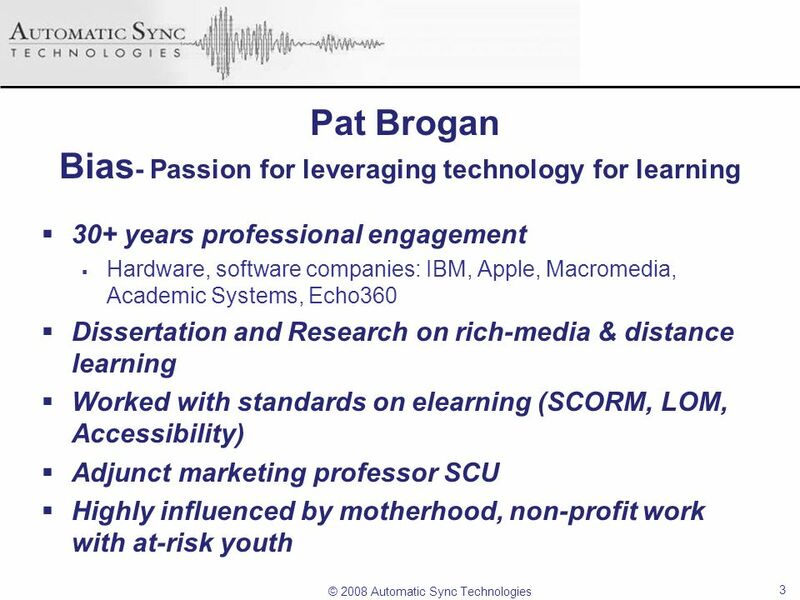 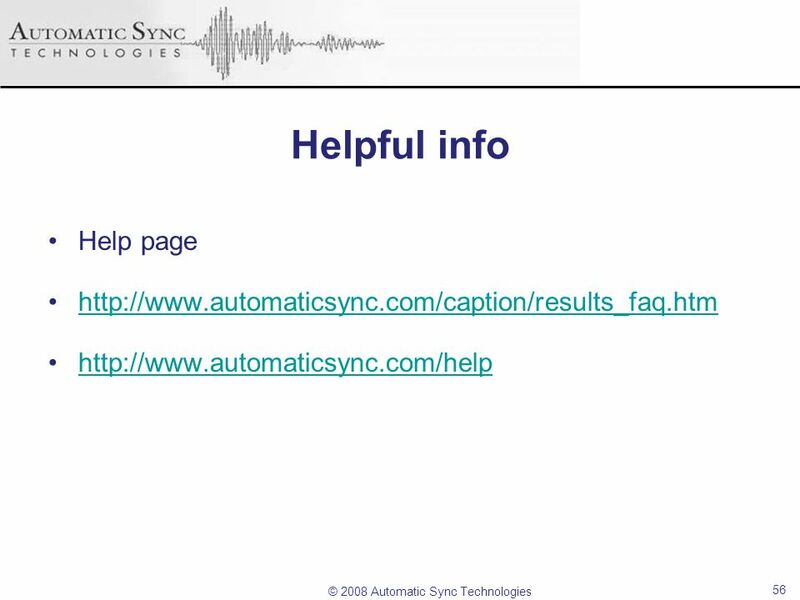 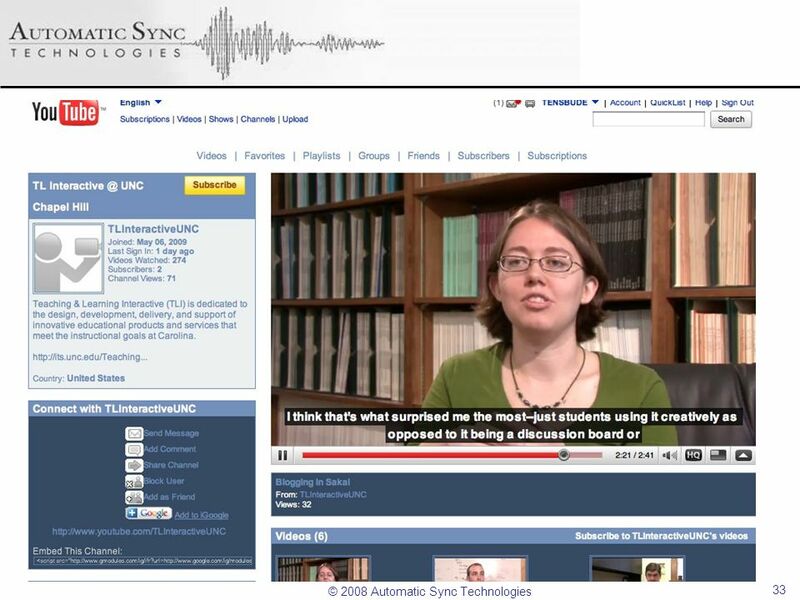 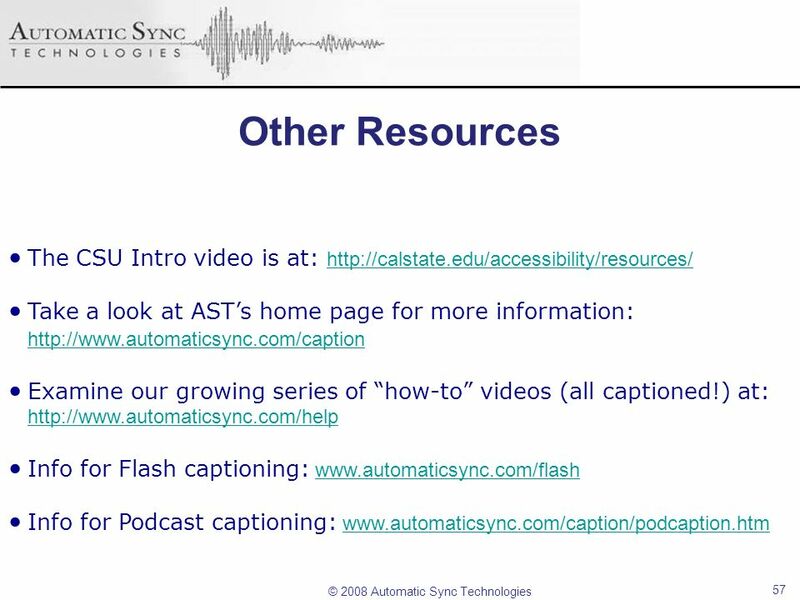 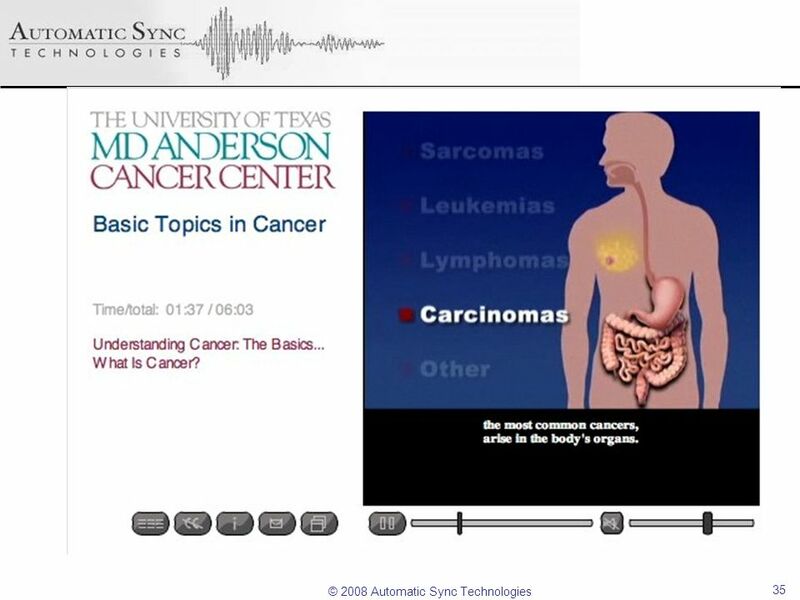 Most campuses were already working with or experimenting with Automatic Sync Technologies. 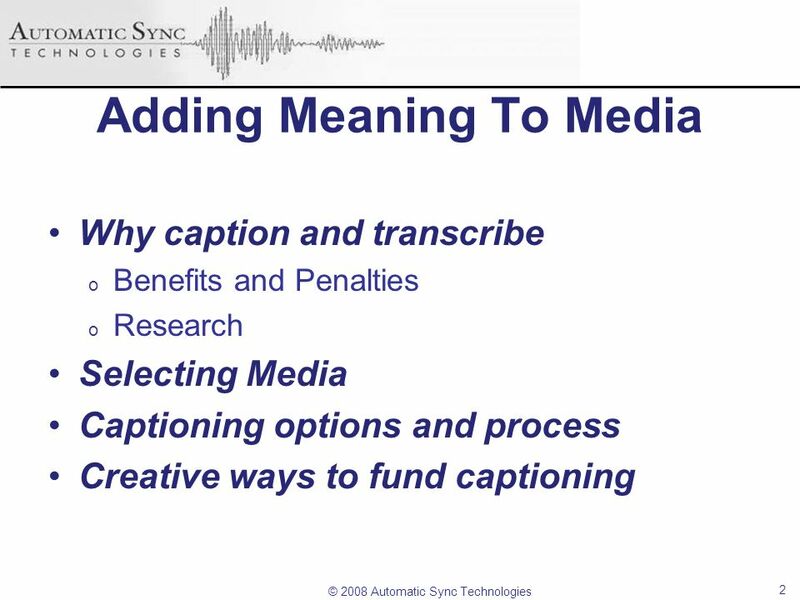 Download ppt "Adding Meaning To Media"
My AmeriCorps Release 3 State Commissions and Programs Program Management Presentation developed for the Corporation for National and Community Service. 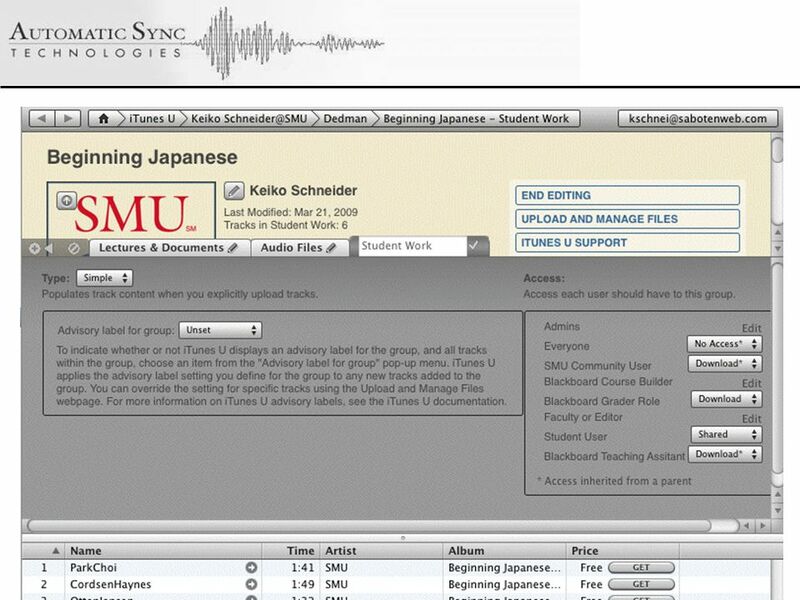 1.step PMIT start + initial project data input Concept Concept.